This decal application instruction printable is the perfect item to add to your adhesive vinyl decal orders. It is simple, to the point, and will clearly direct your buyer on how to correctly and successfully apply a vinyl decal. 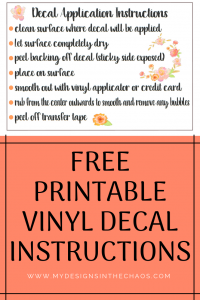 When looking to start selling items with your Silhouette or Cricut, adhesive vinyl decals are a great item to begin with. They don’t cost a ton of up front capital and you can made one for just about any occasion or person. The tricky part comes once they are delivered and the recipient isn’t sure how to apply it to their item. That is where this simple decal application instruction printable comes in handy. Please note that this post contains affiliate links which means at no extra charge to you we earn a small percentage for shopping through out link. Before we get into the decal details I want to share a couple pointers for y’all who are just making the transition into selling items. Use clear transfer tape that has a grid. When your client receives their decal they are going to want to apply it and make sure it is totally even and straight. For us that might be super easy since we do it on a regular basis. But for our clients it will probably be a little trickier. This clear transfer tape makes it super easy for anyone to do. Plus it has a grid on it, which will ensure the ability to line up the decal and make it totally straight. Make sure to clarify to your customer if you are using removable or permanent vinyl. This is a super important step. The customer needs to know if they put the vinyl on the wall if it will peel the paint, or if it goes on a cup and will be pulled off in the first use. Not only do you need to make sure and know about the different types but also make sure that your customer is getting the exact kind they need for their project. We explain about all the different types of vinyl here. You are the expert here and it is your job to make sure that the customer is getting exactly what they need for their specific project. 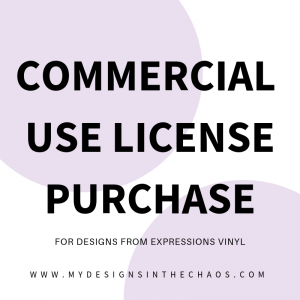 Include the decal printable instructions below for your clients. This step is pretty self explanatory. Just scroll down to the bottom and download this freebie. It will bump your decals up a notch from others in the area selling the same thing. Find out more tips on how to stand out in your market here. One thing that will set you apart is your social media presence. Learn how we grew our Pinterest to over 1 million monthly views in 6 weeks here. Clients can easily become overwhelmed when given endless amounts of options. Give them limited design options and limited color options. A good rule of thumb is 3 designs (or monogram styles but not both) and then 5 color choices. Once they have picked you can then offer a flat fee upgrade of glitter (if available). This way they still get a nice selection but aren’t having to choose a million things at once. This will be a huge time saver for you! When I say batch create what I mean is to do everything in stages. So cut all the vinyl for your decals at once. Then weed all the designs. Then apply the transfer tape to everything. Finally package them all. This will be so much quicker than doing each decal one by one. You will save time and time is money! 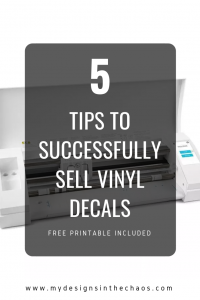 So using those tips and this free download below you will be ready to hit the ground running with making some extra cash through selling your decals. Find out more ways to stand out in the crowd when selling your items here. If you want a different style or design for your care cards make sure to head over and download these free printable clothing care cards and free drinkware care cards too. Sometimes it is nice to have a variety and choices to pick from. We would love to see the cards in action so make sure to either tag us in your product posts (@mydesignsinthechaos) or snap a shot and post in our Facebook group! We want to see your orders on their way out being spiced up with these freebies! Thank you!! These are beautiful and very professional!